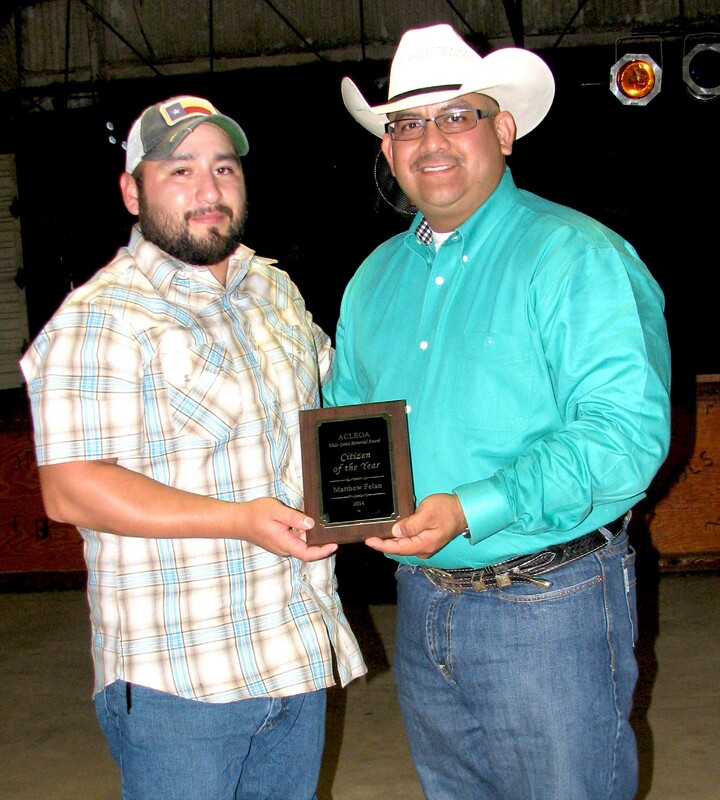 Matthew Felan (left) was awarded the Citizen of the Year at the annual Atascosa County Law Enforcement Officer Association banquet held Saturday, June 13. ACLEOA President Albert Garza presented the plaque of appreciation. On April 24, 2015, shortly after midnight, a Pleasanton Patrol Officer initiated a field contact on a suspicious male. During the field contact, the suspect became combative and assaulted the officer. A struggle ensued. A passer-by, identified as Matthew Felan was driving by when he saw an officer in need of assistance. He stopped his vehicle and approached the scene. With total disregard for his own safety, Matthew Felan joined the struggle with the combative subject and helped restrain the suspect until other officers arrived. The Pleasanton Police Department would like to extend their gratitude and recognize Matthew Felan for having the courage to get involved in a very dangerous situation and help our Patrol Officer. Felan was also presentd a Certificate of Appreciation and a Challenge Coin that displays the motto of the Pleasanton Police Department, “Integrity-Service- Courtesy” at a City Council meeting.